Living in the modern digital age certainly has its benefits. We all enjoy the conveniences contemporary electronic technology offers, especially our mobile handheld devices. How did we ever live without the endless amounts of information, instant results and ability to interact and communicate, all at our fingertips? However, with all the advantages we gain from mobile technology comes the risk of serious and permanent health problems. TEXT NECK IS A GLOBAL EPIDEMIC! 'Text Neck' is a world-wide health concern, affecting millions of all ages and from all walks of life. Widespread overuse of handheld mobile technology is resulting in a harmful and dangerous physical condition on the human body, which is known as Text Neck. Dr. Dean Fishman is a Chiropractor in Plantation Florida, and a leading health care provider for technology induced injuries. Dr. Fishman originated the phrase 'Text Neck' to explain the repeated stress injury to the body caused by excessive texting and overuse of all handheld electronic devices. The term, and the health condition, is derived from the onset of cervical spinal degeneration resulting from the repeated stress of frequent forward head flexion while looking down at the screens of mobile devices and 'texting' for long periods of time. While 'Text Neck' is certainly a new medical term, the condition is impacting millions and is a growing critical global concern. Of the 6 billion people in the world, over 4 billion have mobile phones. Texting has become the dominant form of communication. Over one billion text messages are sent every month worldwide. On the Average, Americans spend 2.7 hours per day communicating and socializing on their phones, and even more time looking down at their mobile devices for web searching and so many other uses. 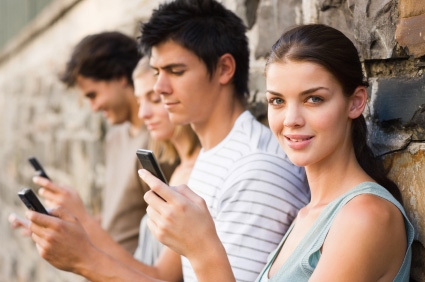 Of course, Text Neck is not limited to the results of texting and overuse of cell phones. People of all ages spend countless hours daily hunched over numerous types of handheld devices. Mobile technology has been designed for just about every application. Tablets, PDA, MP3, game consoles, e-readers, media players, digital camera and video recorders, the list goes on and on. While 75% of the world's population spends hours daily hunched over their handheld devices with their heads flexed forward, they are all in constant danger and at risk of developing Text Neck. The frequent forward flexion causes changes in the cervical spine, curve, supporting ligaments, tendons, and musculature, as well as the bony segments, commonly causing postural change. Among the chief complaints associated with Text Neck are pain felt in the neck, shoulder, back, arm, fingers, hands, wrists and elbows, as well as headaches and numbness and tingling of the upper extremities. In his quest to treat those suffering from the painful and harmful affects of Text Neck, Dr. Dean Fishman founded the Text Neck Institute in Plantation, Florida. Leading the way and breaking new ground, Dr. Fishman is a pioneer in treating technology related injuries. The Text Neck Institute is at the forefront of advanced tech-injury research and treatment. Included in our treatment for Text Neck is Chiropractic Care, Physiotherapy, Physical Therapy, Massage Therapy, Spinal Decompression Therapy, and Excercise Planning. Dr. Fishman is an outspoken advocate of Text Neck Prevention through 'Proper Use' education. Dr. Dean Fishman is respected as an authority in educating mobile technology users how to utilize their hand held devices properly, allowing them to enjoy modern technology without suffering from Text Neck®. He has also created 'The Text Neck® Indicator,' a Mobile Application that alerts users when they are operating their mobile device in an 'at-risk' position, triggering that user to maintain safe and risk-free operation. The Tech-age is clearly upon us. Young and old, near and far, we are always on the run, and always 'connected.' This is truly a mobile world. Text Neck is a serious threat to our entire society which must be acknowledged, and precautions taken. Protect your neck with the Text Neck® Indicator. Please practice Safe Text. The Text Neck® Indicator keeps tabs on your posture and notifies you when you are at risk.